This was the 9th broadcast of Shawa Gohan. Sawako was wearing a grey sweater, and her hair was in double odango balls. 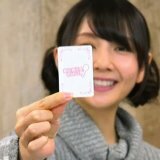 Sawako talked about eating sushi in the previous broadcast. Sawako only goes to kaiten sushi, where each sushi is small. So she had touble eating the sushi because the rice was too big. Then Sawako read some mails. After 10 minutes, they switched to the video of Sawako walking around in Nishi Nippori. Sawako was wearing a brown jacket. 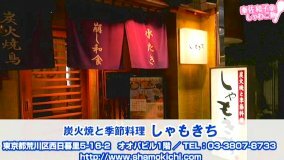 The restuarant that Sawako went to was Shamokichi. It was a store which served chicken dishes. Sawako read some more mails in the restaurant. Sawako has hayfever, but she said that it usually wasn't that bad in the spring. Her eyes just gets a little itchy. The first dish was cheese omlettes. The next dish was yakitori, and then there was an oyakodon with a raw egg. After around 15 minutes in the resaurant, they switched back to the studio. Sawako got a present for going around the Yamanote. She pulled a card, and it was "roll again". Sawako rolled and got a 5. She didn't use the "roll again" card, so the next station was Akihabara. 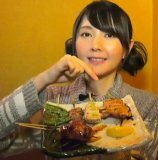 In the previous broadcast from Akihabara, she at pizza, so she said she wanted something different. The next broadcast will be 4/14. The members only broadcast was around 19 minutes. Sawako ate the oyakodon, read some more mails, ate karaage, and ate a chicken nabe.